These dry lands are dryer than they would otherwise be because of global warming-driven climate change. As it turns out, its not just the burning of oil, gas, and coal that’s accelerating the loss of available freshwater, but also the drilling for two of the fuels themselves. A report by Ceres, a non-profit organization that promotes sustainability, found that almost half of the wells that were dug between January 2011 and May 2013 to hydraulically fracture (or “frack”) shale rock to extract natural gas and “tight” oil were located in regions with “high or extremely high water stress,” and more than half (55 percent) were in areas experiencing droughts. For California and Colorado, almost every single new well was drilled in a high or extremely high stress area. This is important because, as the name suggests, the hydraulic fracturing process requires millions of gallons of water per well. Even if that water is trucked in from somewhere else and even if it gets recycled or stays underground, the water used in the fracking process may still end up tainting local water sources with carcinogens, methane, or naturally-occurring toxins like radium and bromides that are brought up to the surface. So it’s little wonder that people who are being harmed in one way or another by fracking are banding together to fight the shale industry as well the industry-captured politicians and government agencies that are pushing fracking along, as this magazine [The American Prospect] has recounted in recent issues. It all sounds a bit same-old, same-old for the Washington national security establishment. There are some questionable findings—actually, exporting more natural gas will likely raise rather than reduce domestic prices; and there are some astonishing omissions—such as that other countries won’t take our coercive energy games lying down, and that the shale boom appears to be exaggerated in the long term, dangerously dependent on (and trapped by) loans and hype, and struggling to maintain growth once the best wells are tapped. These alone should have driven me to check who funded the studies. What astounded me most was the way these studies’ (brief) environmental analyses stayed within the humdrum of America’s present conversation about climate change and water security, which abjectly fails to recognize the urgency of these issues or the types of structural changes that will be needed to actually deal with them. The authors just nod at the issues before moving on, perfunctorily acknowledging them—like a person trying to avoid talking to someone at a party. However, the question of domestic water security hardly makes it onto the security wonks’ radar. Perhaps that shouldn’t be surprising, as national security folks tend to look abroad as do most water security analyses, and the United Nations report linking fossil fuels to water shortages only came out this past Friday. But if the point of national security is to protect our physical safety, our economy, and our “way of life” at home, shouldn’t the reports at least consider the effects of fracking on domestic water resources before promoting more drilling and more exports for dubious geopolitical gamesmanship? There is essentially no mention of the high prevalence of wells in water-stressed areas or of fracking’s enormous thirst for water—some 4 million gallons per well—that gets taken out of our freshwater supplies forever. 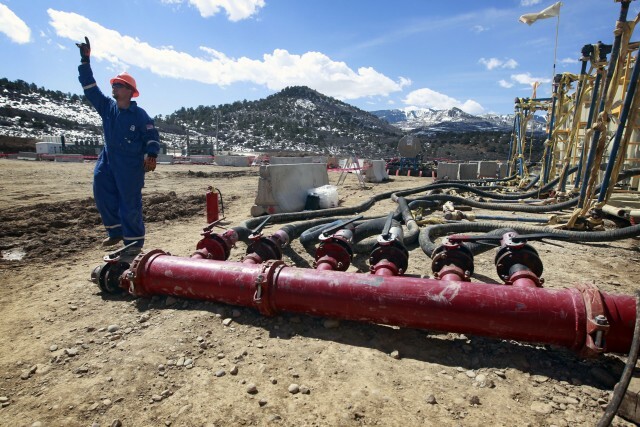 (A low estimate of annual water consumption by fracking in parched Colorado would be enough to supply the state’s fourth largest town for a year.) The reports don’t mention that almost no “produced” water can ever be used for drinking or irrigation because it contains toxins, carcinogens, and a cocktail of chemicals that municipal water treatment facilities cannot address because those chemicals are allowed to remain protected as trade secrets—and that doesn’t include inadvertent pollution. Fracking and drought are running some small towns in Texas totally dry. Right. It would be hard to imagine a framework in which frackers were lessregulated. Indeed, the industry only seemed to blossom once Congress passed a bill exempting it from a host of laws, such as the Clean Water Act, Safe Drinking Water Act, and Clean Air Act. Regulators are spread thin. And even with captured federal and state politicians and regulators, the industry is pushing for more deregulation. Only Michael Levi of the Council on Foreign Relations takes the time to actively argue for more stringent regulation. What makes the others think that things are going to suddenly get a whole lot better? Our government has officially stated that climate change is a major security threat. Indeed, this was reiterated in the Pentagon’s recently-released 2014 Quadrennial Defense Review. Several of the studies dutifully acknowledge climate change—though some do so only in passing and a blue ribbon task force completely failed to mention it at all. Yet even the reports that appear to take it seriously don’t actually take it seriously. As with the government’s pronouncements—such as President Obama’s “all of the above” energy policy—none seem to recognize the urgency and present-ness of the problem. (This is all too common a problem, even among people who haven’t fallen prey to the professional denialists.) And the climate-related topics they do discuss, they tend to get wrong. The results are a greenwash. The think-tankers cheer for shale gas as a tool for freeing the United States from burning coal for electricity. While it is true that reducing the use of coal in the United States is of the utmost importance, and any reductions are to be celebrated, that’s not the end of the story. The coal that isn’t getting burned here is simply being exported and getting burned elsewhere; 2012 saw record exports, helping to feed, among others, coal-hungry China. The earth’s atmosphere doesn’t care where coal is burned. CNAS, for instance, mentions that Europe has been replacing Russian natural gas with cheaper U.S. coal, yet fails to notice how that might undermine its cheerleading. Several reports discuss energy efficiency (notably CNAS’s) or reductions in demand (notably RAND‘s)—which are both vitally important—yet for they fail to place these issues in the context of how carbon dioxide works. It doesn’t matter whether fossil fuels are burned today, tomorrow, or next year because CO2 accumulates in the atmosphere and sticks around for decades to centuries. That means that energy efficiency and demand reduction only work if they keep carbon in the ground rather than merely postponing the burning. But the studies advocate more drilling and more exports, which means burning more, not less. And here’s the kicker: according to major organizations like the Intergovernmental Panel on Climate Change and even the industry-friendly International Energy Agency, a full two-thirds of proven fossil fuel reserves—the stuff that has already been located and is economically and technologically accessible now—needs to stay in the ground to avoid the “nightmarish” average global warming of two degrees Celsius. Two-thirds may even be a low estimate. One of the statutory exemptions the fracking industry enjoys is from having to tell the public the ingredients of the chemical soups they use drilling for shale gas and tight oil. At the CNAS event at the Willard, task force member and former secretary of Energy Bill Richardson said that shale drillers really need to share their recipes. But—and here is the big but—he said that he could only say something like that because he wasn’t running for office. It’s commonplace for industries to launder their business and regulatory goals through think tanks in order to recast them as legitimate and valuable ideas. When an industry tries to paint a patina of national security relevance onto its business goals—usually to get a helpful hand from Uncle Sam—I would call it camowashing. It should come as no surprise then that all of the think tanks issuing reports and commentary proclaiming fracking’s supposed national security benefits and giving only short shrift to climate change and water security were directly or indirectly funded by the oil and gas industry as well as private equity and investment funds with big fossil fuel stakes. Some even take money from industry lobbyists. CNAS receives funding from the fracking industry’s lobbyist and public relations outfit, the American Natural Gas Alliance. The Institute for 21st Century Energy at the U.S. Chamber of Commerce, a fossil fuel lobbying project at the country’s biggest lobbying shop, a/k/a the “Chamber of Carbon,” directly funded the RAND study. Non-ideological think tanks and their researchers claim to be impartial and objective, unmoved by their sources of income—and they really do try. But that’s an unachievable goal. Organizations and their researchers depend on steady funding. As they say, you don’t bite the hand that feeds you. I know this having worked at one of these think tanks. Even if the funders don’t loom over a project, researchers censor themselves: All it takes is one or two instances of your supervisors frowning and telling you that what you’ve written is critical of the funder and that you ought to be more careful, and suddenly you find yourself pulling punches. And sometimes the funders directly meddle with the research, shaping the questions or constraining possible recommendations. I once worked on a camowashing study funded by an industry association that had its lawyers go over the final draft line-by-line, forcing changes on us. It kind of makes a person wonder how great fracking really is for our national security, doesn’t it? Sometimes I wonder if ANYONE in these “think tanks” can actually think (no offense to the author of this piece). U.S. energy policy comes perilously close to having this shape: forget about who’s funding us, forget about the profit motive. Let’s just design THE WORST policies possible in terms of impact on the environment. The UN’s latest dire warnings about global climate chaos (my preferred terminology) didn’t tell us anything we didn’t already know. We (I obviously exclude the “deniers”) have known of these dangers literally for decades now. The human race is setting itself up for unprecedented disaster, a disaster that could have been at least mitigated by sensible policies. AND WE ARE ALL GUILTY of not rising up and declaring “Enough! We are removing you bumblers, you enablers of disaster, you paid apologists for Big Oil from power!” We have sown the seeds of our own destruction. Get ready to reap the harvest. Reap the whirlwind, the drought, the wildfire and the flood. Oh, they’re all underway already, but “we ain’t hardly seen nothin’ yet”! !